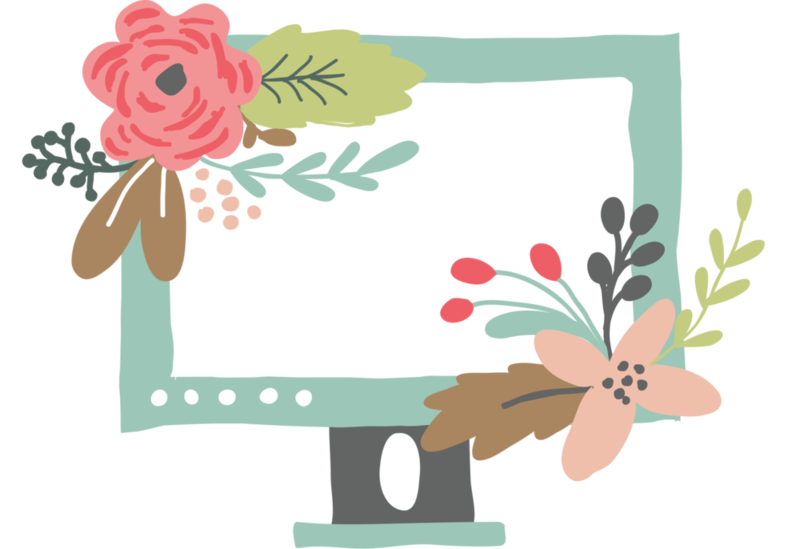 Finding Joy in Your Home Free eCourse! Finding joy within our homes is one of my most requested topics. How do we find joy - real joy - within our days? As women, a lot of what we do can seem mundane and tedious. But when we view our homemaking (and our life) through the lens of the Bible, we can begin to experience real Joy, Peace, and Tranquility in our lives...all for God's Glory. This free training is a 5 part video series that walks you through the essential habits that all Christian homemakers must form! 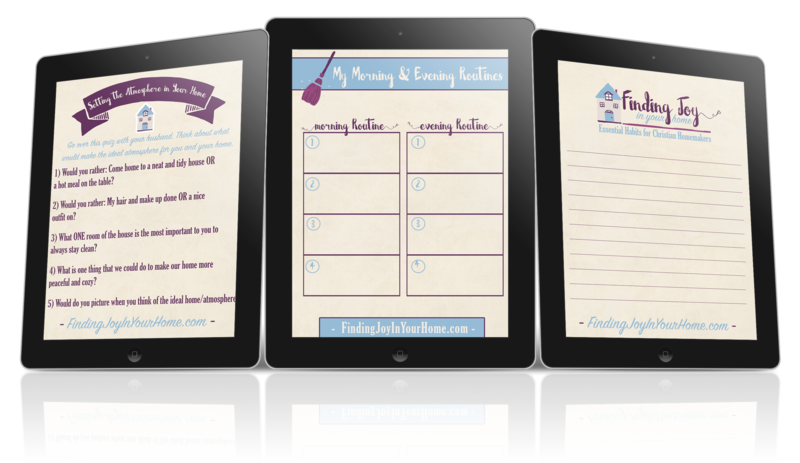 Included with each lesson are printable worksheets to help you make the most out of what you are learning. Start to find more Joy in your home by using an atmoshpere quiz, a morning and evening routine worksheet, and more! Whenever I have talked about finding joy in your home on my blog and podcast, I get an overwhelming amount of feedback! I get emails, comments, and messages from women who are seeking more joy in their lives, homes, and families. I decided to turn this into a free 5 part mini course because this is something that desperatly needs to be addressed today. I know for myself, with four little kids, joyful is not often the way I would describe my home and my days. 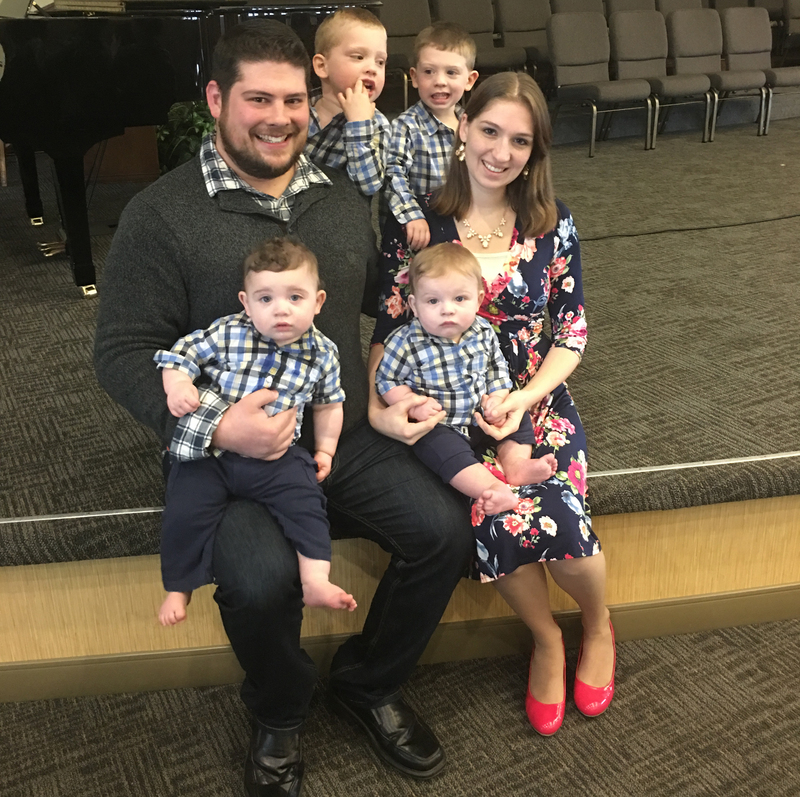 Have four little boys all under three years old (two sets of twins) is really tough sometimes and joy is not something that happens by accident. So what is the real source of our joy and hope? Is it in this world? In our home and our possessions? Or Instagram feeds and how "put together" we look on social media? Or is our joy, our peace, and our tranquility found in the Lord? In this mini-eCourse we take a look at what real joy and peace in the Lord looks like and then I am going to give you and help you develop the essential habits that we all need to build into our day. With each video and our bonus worksheets, you will be able to take the princpals you are learning and tailor them to fit your family, your home, and your life. Are you ready to jump into the first lesson on setting the atmosphere in the home? Scroll up and hit "Sign Up Now"! In this first lesson we are going to start with the basics: what does it mean to set the atmosphere in our homes? As women, we have a unique ability to set the tone in our homes - for the good or the bad! With our thoughts, actions, and speech we can either drive our family towards God or tear them away from Him. this lesson is going to cover what it looks like to set a God-glorifying atmosphere in your home and is our first step in finding joy within our homes. In this lesson, we are taking a look at how, by building small simple routines into our day, we can start to step out of that survival mode and start living with more joy! We will give you the tools you need to start implamenting small baby steps and routines. In the last video we talked about forming small and simple routines in your day. We started with that first because we need to start having some order and routine in our day for things like Bible reading and prayer to even happen. So now that we've got the discussion going for that, we are going to turn our attention to perhaps the greatest lesson we will talk about throughout this course, and thats: Our daily Spiritual disciplines. n this lessson, we are going to take a look at the Gospel and begin tying together the principals we've learned throughout this course. So far we've covered what it means to set the atmosphere in your home, developing morning and evening routines, and the importance of daily Bible reading and prayer. So now we have to ask ourselves, why? What's the point of these daily habits and ultimately - what is the purpose within our home? In today’s lesson we are going to take the principals and lesson’s learned so far and turn our attention to how we can now cultivate more joy in our home. In this lesson I’m also going to be sharing some more resources for diving in deeper, learning more, and getting help with online mentors. How can we find peace, JOY, and tranquility in our homes? In this free mini-eCourse, Jami Balmet walks you through the basics in this 5 part video course.